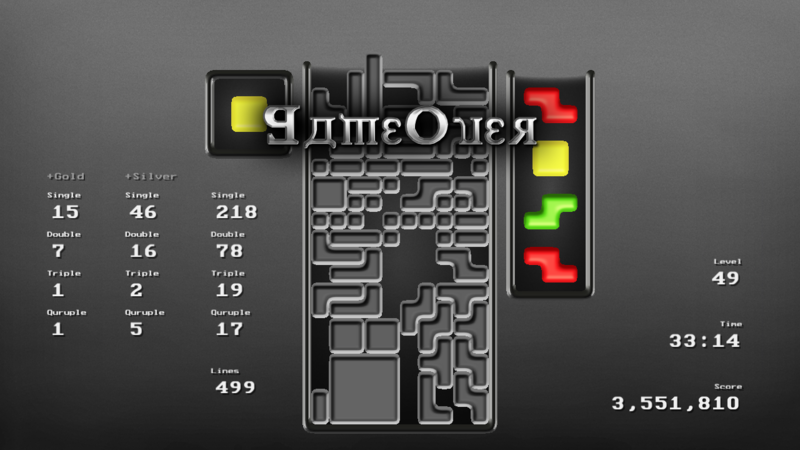 SirTet, Totally not another Tetris clone. Hello all, I'd like to share the latest project I've been working on. It's now playable-ish. Any thoughts, feedback or bug-reports are much appreciated. 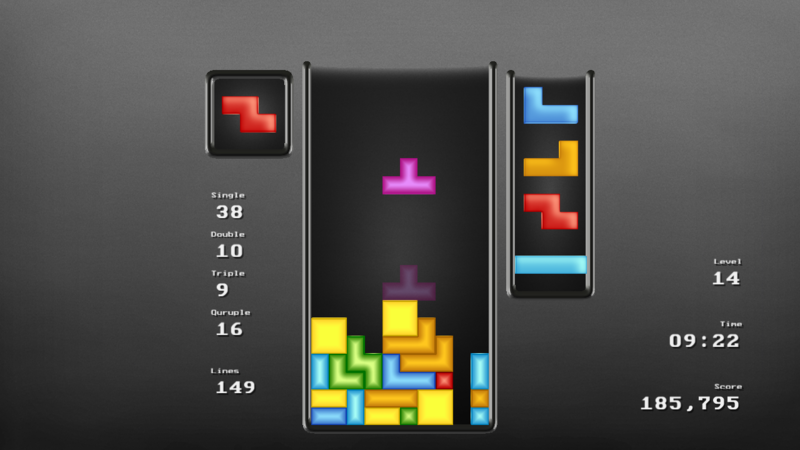 "The New Tetris" style 4x4 combo blocks. Small download, quick to load. 240Hz, 120Hz & 60Hz gameloop-speed modes. All game code is integer based, no floating-point. This avoids rounding-errors and the slight gameplay inconsistencies associated with them. Nice looking game and good luck on it! Just an Irish tetris player. Fixed animation bug for first held block. Are there any profile features you'd like to see in particular? Spent last week working on an update. The game finally has The New Tetris style 4x4 combo blocks! This is one of the reasons I started to project, I wanted an easy way to play The New Tetris without an emulator or original hardware setup. It feels great to finally have them. There are also proper game modes now; Marathon (endless play), Sprint (40 lines), & Countdown (2 minutes). With "+" modes that have the 4x4 combos. this looks really neat! Keep working on it! This is exactly the reason. I like the precision & consistency of having the game values iterate at specific values at a specific FPS/GameLoop-speed. I recall playing older PC first person shooter games where is was possible to jump slightly higher or run slightly faster if you disabled vsync and let your FPS go higher. This is the result of accumulated floating-point rounding errors, it builds up quite a bit when you are doing an operation 10s or 100s of times per second. To remedy this issue most modern games just lock the FPS at 30 or 60. Or they have the GameLoop & the RenderLoop operate independently so the rendered FPS can go all over while the GameLoop is operating at a set speed. If you are familiar with TeamFortress2 & CounterStrike they call the gameloop speed TickRate. I chose not to go this route, mainly because it's difficult to implement. Thanks for the feedback & support! Cool, thats a great explanation. I personally go for event based logic with rendering as fast as possible. Depending on underlying engine, you can get inputs polled millisecond accurate (i.e. 1000hz). If you use timers for everything, errors won't accumulate (i.e. you use a timestamp for when they press the key etc, you have a timestamp for when the piece spawned, and then calculate its current correct position based on curretn timestamp + time taht the player pressed down key etc). Just looked through a few of your forum topics. 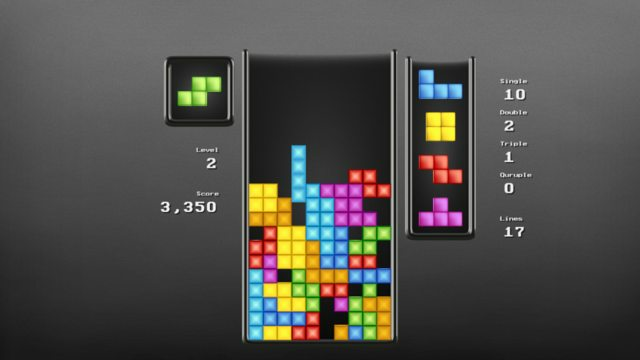 It appears you're a bit of an experienced Tetris-player & developer yourself. I'll admit, I'm an amateur Tetris-player & developer. I started this project thinking it would a be a quick & easy thing to do. 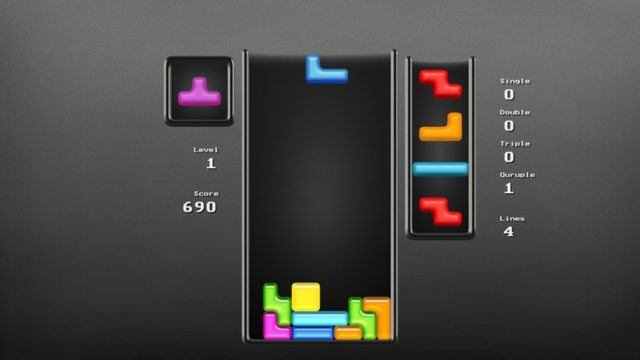 As it turns out, Tetris is a pretty complex and nuanced game. 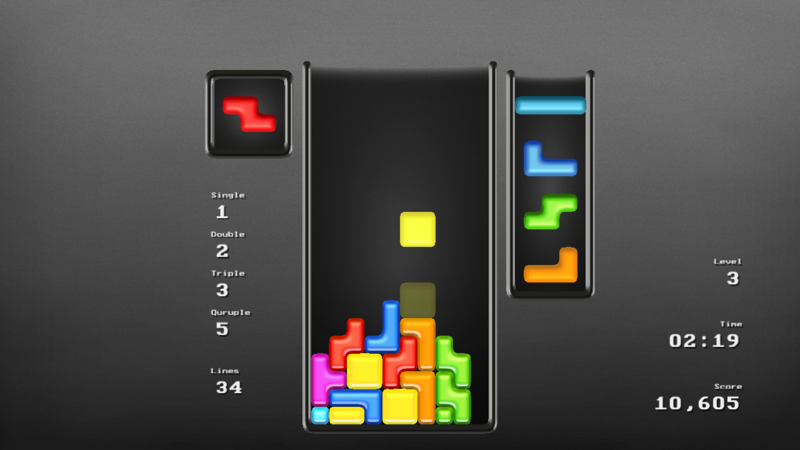 It's certainly been a educational experience for both developing games and having a deeper understand of Tetris. I had considered using a time-delta to update the game state but, I like the idea of the game state updating in a consistent, iterative manner. And hearing speed runners talk about "frame perfect inputs" and such, just sounds cool. I really like how this game looks! Great job! I have a few mechanical nitpicks though. The lack of a ghost piece is a little annoying for me. I'm not the fastest Tetris player and I haven't memorized finesse fully yet so not being able to see where I'm going to hard drop is a little annoying. It seems a little contradictory that you have instant soft drop but ARR and hold/piece delay is so slow. The lock delay of the piece is a bit fast for me, especially because I have to make sure it dropped in the right spot after instant soft dropping. EDIT: After looking at your previews on the download site, it seems it does have ghost piece, however it doesn't seem to show on mine. If you look in "Player Options" there are options for a ghost block and/or ghost column. Perhaps I'll have to rethink allowing instant drop in certain modes... Or, reduce the spawn/hold delay. The Lock delay, Hold/Spawn/LineClear delay, and 4x4 Spawn delay are 500ms. These seem to be pretty standard. Also there's a typo with quruple, maybe it's intentional, maybe its a space issue, most games use the term "quad"
Renamed the Drops and renamed AutoMove to DAS, thanks for the recommendation. "Quruple" is intentional. I didn't like the sound of "Quadruple" or "Quad", so I made up "Quruple". I pronounce it crew-pull. The game now stores high scores.